This Nissan Silvia fuel rail kit is specifically designed for SR20DET S14/S15 style intake manifolds. For the SR20DET S13 fuel rail kit, go HERE. It features a large 0.69" internal diameter bore to suit even the most fuel hungry engines. The rail is CNC machined from solid 6061 aluminum and black anodized for a high quality surface finish. The included hardware mounts the fuel rail to the OEM intake manifold bosses. The Radium fuel rail converts the OEM side feed fuel injector setup to top feed, allowing the use of high flow fuel injectors (not included). The fuel injector bores are 14mm ID. 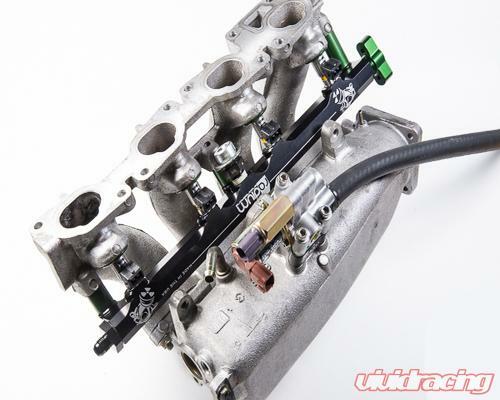 Note: Top feed fuel injectors designed for 11mm bores can be used by switching the top O-rings to 14mm style O-rings. The kit is designed for specific upper and lower O-ring spacing, as depicted above. Different height injectors can be used, but longer or shorter spacers and hardware may be required. Below are some of the many fuel injectors that are a direct fitment with this Radium fuel rail kit.To resist oxidation corrosion, the lower billet aluminum injector seats are anodized and laser etched. They are O-ring sealed and designed for 14mm top feed injectors. This kit is compatible with all fuel types including popular alcohol mixtures such as E85. The OEM 2-bolt IACV bypass hard line is replaced by a billet aluminum IACV spacer kit to gain clearance for the top feed fuel rail. An anodized aluminum barb adapter and rubber hose is supplied to reroute the charge pipe hose externally to the manifold. One gasket is included for the IACV spacer.. The rail is CNC machined from solid 6061 aluminum and black anodized for a high quality surface finish. 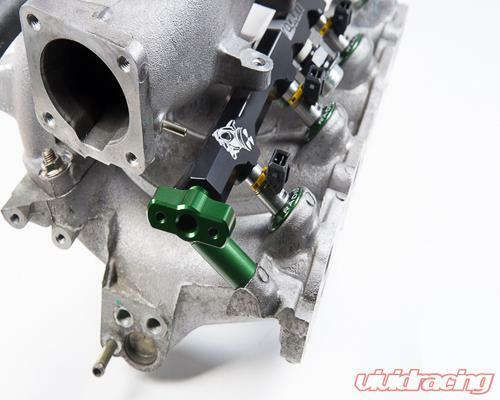 This Nissan Silvia fuel rail kit is specifically designed for SR20DET S14/S15 style intake manifolds. 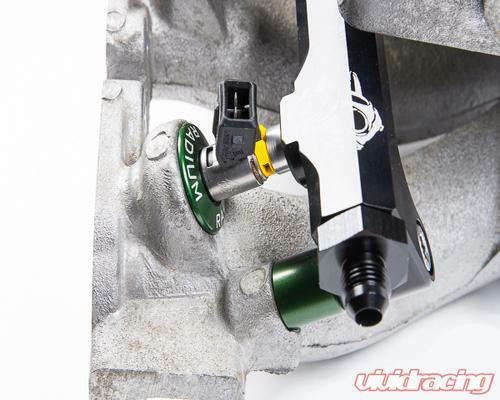 Top feed fuel injectors designed for 11mm bores can be used by switching the top O-rings to 14mm style O-rings.